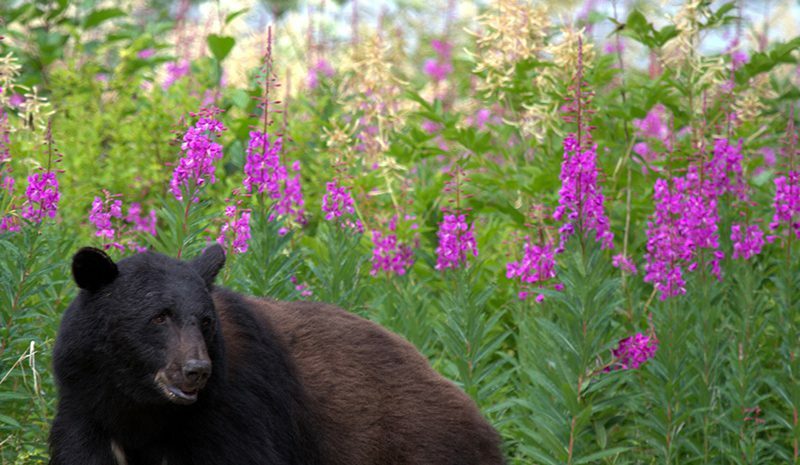 Whether you’re on a casual day hike or a backcountry camping trip, Alaska affords plenty of opportunities for seeing wildlife—especially its famous bears. To help you prepare for your trip to Alaska’s wilderness, we’ve put together these important tips for speaking a bear’s language in the wild. Hint: Get your vocal cords warmed up. First, get to know your bears. You will find grizzly bears—more accurately called brown bears—as well as black bears in Alaska. You can’t always identify these bears by color, though. There are some cinnamon-colored black bears and some black grizzly bears. Size, also, is not an accurate way to differentiate. Grizzly bears have a pronounced shoulder hump and a concave or shovel-shaped face. Grizzly bears are more likely than black bears to be aggressive when they feel threatened—black bears are more likely to retreat. However, black bears are equally as dangerous. Black bears are excellent tree climbers. While grizzlies are not particularly inclined to climb trees, they can, so don’t expect that scaling a nearby pine will get you out of a scrape. Bears will usually only attack if they feel threatened. They are highly unlikely to seek you out as food. If a bear sees you and stands on its hind legs, it’s just trying to get a better look. If it approaches you, it’s still trying to learn more about you. Now you should make yourself as large as you can using your clothing, sticks or other things around you. Speak in a loud, low voice. Back away slowly. Bears are not territorial, but they will fiercely defend their young. While it might be an attractive photo op, a mother grizzly with cubs is the most dangerous bear situation you can encounter. Give her lots of space. Think you’ve given her enough? Double it. If you see a cub by itself, leave the area. The mother is nearby. Knowing how to avoid a confrontation is your best defense. If you plan on doing a lot of hiking in Alaska, imagine yourself alone in the shower or driving in a car: Sing your favorite song like no one’s listening. Bears can be oblivious, particularly if they’re distracted by a patch of tasty berries or are focused on catching salmon. Rushing water can drown out footsteps. So, talk, sing, yodel. Say the A-B-Cs. Anything to let the bears know you’re there! Most attacks happen when bears are surprised. A constant voice helps ensure they aren’t startled, and it also helps bears identify you as human. We’re generally not considered good prey. Staying on designated trails can help, but you still might encounter a bear in Alaska in popular areas. Leave Fido at home. Dogs are naturally curious and poke their noses where they don’t belong. Canines have been known to discover a bear and come tearing back to their owners with a bear chasing close behind. Not good. Carry bear spray, which is available for purchase in visitor’s centers and sporting goods stores. It’s a type of pepper spray that will stop most bears without permanently injuring them. Are you camping? Properly store your food to avoid attracting curious ursines. Once they know the food is there and accessible, they might go through you to get it, and they may become problematic regular visitors to campsites. Follow commonsense rules in bear country and ask local rangers and guides for their advice when you’re out hiking during your stay in Alaska. Find out where bears have been recently sighted. Let someone know where you’ll be hiking and keep your eyes (and lungs) open for a safe and enjoyable trip into the Alaska wilderness.